Yesterday, I received the following word of warning in an email from Z3 contributor Casey Toda. I honestly am not sure if it was The Lord or one of His angels who spoke this but I heard it very clearly. I asked for scripture and God told me to read Isaiah chapters 8-10 and Jeremiah chapters 19-21. I did not know what was in these chapters, but they parallel and confirm what I had heard. As Casey was told, the prophet Isaiah warned Israel about destruction coming upon them because they refused to trust in God. even the king of Assyria and all his glory; and it will rise up over all its channels and go over all its banks. The northern kingdom of Samaria was allied with King Rezin of Syria (Isaiah 8:4 and 8:6). Samaria refused to trust in God, “the waters of Shiloh that go softly.”Instead, they trusted in King Rezin to protect them from the Assyrians. Because of this, God sent the Assyrians to overflow their land like a flood (Isaiah 8:6-7). Afterwards, the king of Assyria also invaded Judah (Isaiah 8:8). This was partially fulfilled about three years later when Assyria destroyed Rezin, King of Syria (2 Kings 16:5-18 and 2 Chronicles 28:20-25); then more completely fulfilled with Israel some eighteen years afterward when the ten tribes were taken captive (2 Kings 17). Instead of repenting from their sins, the Israelites defied the judgments of God by saying they would rebuild their cities with stronger material, large hewn stones and cedars that are stronger than sycamores, which grew abundantly in the low lands of Judea, but weren’t considered good building material compared to cedars (1 Kings 10:27; 2 Chronicles 1:15; 9:27). King Rezin of Syria was destroyed by his enemies (2 Kings 16:5-18). 8 The Lord sends a message against Jacob, and it falls on Israel. 12 The Arameans on the east and the Philistines on the west; and they devour Israel with gaping jaws. In spite of all this, His anger does not turn away and His hand is still stretched out. 13 Yet the people do not turn back to Him who struck them, nor do they seek the Lord of hosts. Our leaders were defiant then and appear to be just as defiant today. This past Sunday marked the 15th anniversary of the 9/11 attacks, so the NFL conducted a brief memorial service at stadiums throughout America prior to the start of every game. However, they were careful to omit any mention of God from their memorials. After all, someone might get offended. So they offered up a moment of silence instead. Does this sound like a nation that has turned back to God? Not hardly. We are more devoted to the god of political correctness today than ever. The good news for ancient Israel was a righteous remnant escaped destruction and truly relied on Yahweh. Even though many were destroyed, righteousness was restored to their land in the end. 20 Now in that day the remnant of Israel, and those of the house of Jacob who have escaped, will never again rely on the one who struck them, but will truly rely on Yahweh, the Holy One of Israel. Just like Israel, I believe righteousness will ultimately prevail in America. The only question is, who and what will remain to be part of it? While I was running errands today the Holy Spirit said, “Consider this tree.” I was looking at a giant tree I had never seen before. He then showed me a river next to it and I was calm and relaxing with my feet in the water. I knew in the back of my mind that there was a verse relating to a “tree planted by the water” so as soon as I got home I looked it up to see what He was telling me. Well, the “heat comes” quickly but so thankful that the Lord is reminding me that we need not worry if we are trusting in Him and putting our confidence in Him! Simply awesome Mar. Thank you for sharing. Thank you for being faithful………and to many of us that will endure to the end……. There is no doubt that a great percentage of United States Citizens have fallen away from the Lord Jesus Christ. However, with the news being so bias and liberal we will never know how large the true remnant has grown. I have heard stories of GREAT REVIVAL coming to many states. Revivals that are led by the Holy Spirit. We have been praying for revival to come to Owsley County. There is NO DOUBT we are living in end times but we must always remember our GOD wants no one to perish. So use these turbulent times as way to get people to open up and talk so that you can witness to them about our Lord Jesus Christ. Always remember when destruction occurs if you are spared then fulfill your purpose. Bring home the harvest, that is our purpose as servants in his Kingdom. Lord of Lords and Kings of Kings. Indeed “revival” is coming, but it won’t happen until some major horrific events occur. This country is so spiritually comatose, with most professing Christians being so lukewarm, discipline is needed to wake people up. The “revival” will be with grief and tears . . . A bitter-sweet time because souls will be coming into the Kingdom of Heaven with miracles, signs and wonders. . . BUT during a time when millions will perish. LORD HELP US ALL BE FAITHFUL TO THE END AND OBEY YOUR COMMENTS FULLY!!! Before I experienced your affliction I went astray but because of your affliction I learned your statutes. And your statutes are more valuable than pieces of silver and Gold. It will be in the affliction/judgement that we will see many come into the kingdom so I’m praying for the harvest, not for delays, not against the judgement. I woke up Thur. Sept 8th hearing someone singing “The shaking is beginning.” I immediately thought of Heb. 12:26,27 which I had read just a few days earlier. I have had such a heaviness in my heart today. So heavy that when I was working in my yard this morning I had stop and kneel down and pray in our shop, (didn’t take the time to walk into the house) as prompted by the Lord. I was prompted to pray for MERCY for my family and especially for the children in our entire family, the little ones. I know what is coming is going to be horrific, but by God’s strength we will endure. I pray for mercy on all of us! Your post makes good sense. There is much devastation coming. Much. But God has assured me today that as we draw ever closer to Him, HE will be our Peace!! Thank you for sharing Casey’s message! The picture depicts a home destroyed in an earthquake. So far the only post about that is Ed W. What ever type of shaking Caseys warning is about we should all be getting ready. 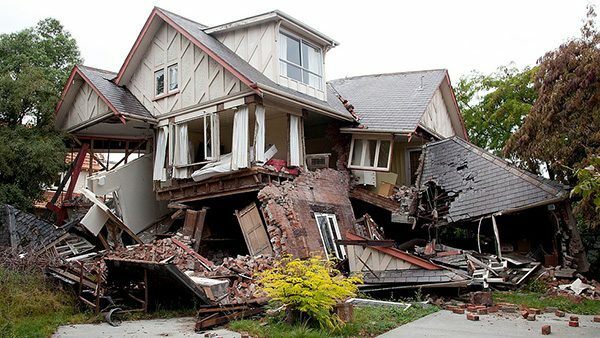 I had a dream last weekend that I was buying earthquake insurance and it was only for a small period of time. Could have been a warning as well. I think that most awake Christians will admit the tremors have already started. We need to tolerate LGBT people but how dare we pray in public or say out loud God Bless you. Starbucks caves in and takes Merry Christmas off their cups because that’s just too offensive to some people. Target caves in and now has transgender bathrooms. Thank God for righteous people because after that their stock dropped. High school football plays Metalica “For whom the bell tolls” during time outs. But don’t you dare consider a Christian Rock band that might offend someone. This country has a bunch of grown men that never grew up and are afraid to stand up for what’s right and for what’s wrong. Everyone gets a prize and everyone is a winner. So now all their kids grow up and everyone feels entitled and does not want to work and also want $15/hr min wage. God needs to give America a serious spanking I’m surprised at his mercy he should have done it when we took him out of schools. The entire chapter is about the judgment of the one who “sits as a queen”, saying “I will never see destruction”. Yes Ed it’s what it looks like, put that with was it AA Alan’s dream on top of the Empire state building? I am not sure if A.A. Allen’s vision applies, as that seemed to be a chemical or nerve gas attack and nuclear missiles coming over our northern border, but shaking could take many forms. I assumed Casey meant earthquakes. The Allen vision also dealt with Jer 25 – the golden cup in God’s hands that had become polluted, and USA was now required to drink from His cup of judgment. Staggering of the Statue of Liberty was accomplished, until it’s complete demise in the Gulf of Mexico. Not a pretty picture. There are probably hundreds of visions, dreams, and words on the destruction of at least parts of America by earthquakes, volcanic eruptions and tsunamis. Mean Grebins post she just put on Facebook says “do everything you have to by November “. Do you mean Mena Lee Grebin? We missed it and now it doesn’t look like it has been kept up to view. Did you see it? I was able to catch Mena tonight. Very heavy, I believe she’s putting it on her Faithfulwalkhealingministeries site. It’s here, the judgement. So be prepared spiritually and physically, keep oil in your lamps. Be aware Mena has her Watchmen call in meeting Sept 30, at 8:00 pm Eastern time. She will go into more detail then, pastor Ben Fairclothe will be her guest that night. It will be worth calling in. Yes, just posted a summary under Sonia’s comment. Monia, how do you access Mena Lee’s LIVE teaching ? Do you just go to her FB page at 6:30 pm? I meant Sept 30th for the internet access. Sorry I know some typos/grammar mistakes but tried to put everything I could remember. Linda, looking forward to hearing your interview. The one from last Wednesday was excellent. God bless you! You beat me to it, Linda. I was just ready to post your warning here. Sadly, I believe your warning is entirely correct. Thanks for sharing. Also, I’m sure you didn’t recognize “o” and his wife at that time since they were not well known, but identified them in later years? I knew nothing of the O’s at the time of the vision. The black widow dress got me to thinking. We will wait in further developments.